“Nine horses this morning, six different yards.”Bruno is the ninth patient today. The horse is a 15.2 hh Anglo Arab dressage schoolmaster-aged 14-and adored by his owner, Catherine. Knowing that her horse is in the care of a qualified professional is important to her. Formerly a member of the Household Cavalry, Chris began his career in Equine Dentistry 15 years ago. Most of his working days are spent carrying out routine mouth inspections, rasping teeth and travelling between the four-legged clients he attends in different counties. Chris has taken apprentices under his wing and seen them through their training to becoming fully qualified technicians themselves. He is a man of conviction when it comes to training and qualifications and is himself an examiner. BEVA (British Equine Veterinary Association) and BVDA (British Veterinary Dental Association) examinations were set up a few years ago. Degree courses in equine dentistry were not available before then! Check that the Equine Dentist or Equine Dental Technician you consider using has undertaken an exam approved by DEFRA. If in doubt, visit the BAEDT (British Association of Equine Dental Technicians) website.It is frustrating that the law, as it stands allows anyone-who can afford to buy the necessary equipment-to set themselves up as equine dental technicians. If you are considering an apprenticeship with an equine dentist or dental technician, or are looking for the right person to care for your horse’s teeth, check that they are suitably qualified first. 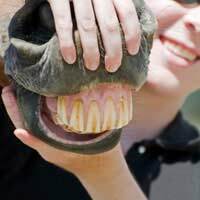 Apart from the obvious reasons of protecting your horse’s health, or learning practical dental techniques correctly, there is also the issue of insurance...medical malpractice and public liability for starters! An equine dental technician’s daily work consists of regular routine mouth check-ups and dental procedures to ensure good oral health. First the horse has an antiseptic mouthwash (they pull faces but don’t gargle) then, with lamp on head, Chris gazes into the depths of the horse’s mouth, hand rasp at the ready. “If a horse is going to freak out, I’d rather he did it when the rasp’s in his mouth than the gag-that has to be removed somehow!”Chris moves quietly and confidently; there is no freaking out. Chris uses a motorised dental kit, attached to a compact mobile unit strapped around his waist-this supplies power and water to the tools, leaving his hands free to work in the horse’s mouth.The machine emits a gentle noise and the rasp sounds nothing like a human dentist’s drill! Bruno has the full mouth speculum, or gag, fitted to hold his mouth open during examination. Enamel points are rasped smooth to prevent mouth lacerations, ensure the horse can eat comfortably and wear a bit in his mouth. Tartar is removed and a final mouthwash and check before Bruno is given a clean bill of (dental) health. Dental charts of each horse are filled in. These are important documents; so accurate record-keeping is also an essential part of the job. Personal physical fitness is also necessary because this is a demanding job, with technicians’ shoulders, elbows and backs most vulnerable to RSI. Experience of handling horses and a gentle approach (bedside manner?) are definitely good starting points for anyone who wishes to pursue this career.A last look at Leo, who cheekily pokes his tongue out at us as we leave: he looks ready for a few more carrots.